The Tuli Block is an incredible corner of Botswana. Internationally known for its spectacular wildlife and flora and impressive landscapes this small piece of land is nestled between Zimbabwe and north east South Africa. 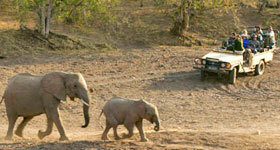 Easily accessed from both South Africa and Zimbabwe, Tuli Block offers a unique, breathtaking experience. Much of the area is unfenced allowing wildlife to roam freely between the Motloutse and Limpopo rivers in between one farm and the next. 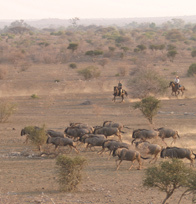 Herds of wildebeest, kudu, eland, impala, warthog and waterbuck migrate through the area drawing predators in their wake. Lions, Cheetah and Wild Dog are ever present and can been seen in the area along with an astounding variety of bird life. Over 350 types of bird have been spotted in the area and has become an attraction to bird watches from all over the world. The rare Pel’s Fishing Owl can commonly be seen at night. Privately owned game farms litter the landscape giving visitors to see these majestic animals. Elephant and crocodile laze along the river banks in the shade of the gigantic Nyala trees and yellow barked fever trees. With the backdrop of the Tswapong and Lepokole Hills in the southeast as well as the fascinating geographic feature of Solomons Wall this is truly an awe-inspiring place to visit. Gigantic gorges carved into the granite rock hills create magnificent waterfalls and rock pools which are perfectly matched with diverse vegetation flourishing in the area including Baobab trees and gaunt sesame trees, which grow in the rocky outcrops. The larger part of the eastern section has been declared the Northern Tuli Game Reserve. Tuli is translated to Land of the Giants refers not only to the large amount of elephant in the area but also the colossal land forms, open skies, baobab and Mashatu trees and the bird life. The Tuli area is home to the kori bustard, Africa’s heaviest flying bird. The reserve takes up a 78000 hectares and is shared between private game farm owners and local communities. Historically this land has been regarded valuable. It was home to Bushman for hundreds of years and their painting still adorn rock faces. Ancient settlements are scattered throughout the area as well as the remnants of Cecil John Rhodes attempt at creating a railway from Cape to Cairo. The British used the land as a buffer from the Boers and during the Boer War it was a site of battle. After Rhodes moved the tracks due to several rivers, gorges and rocky outcrops, the land was sold to farmers. After the world war farmers realised that the land was unsuitable for farming and the turn towards tourism began. The Tuli Block is now the home to some of the most unique and spectacular flora and flora populations in the world. For more information and bookings contact Travel Adventures Botswana by clicking here and for more information on various areas in Botswana click here.